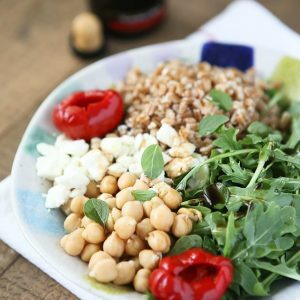 This Mediterranean Farro Salad with Arugula & Chickpeas is a hearty & healthy vegetarian whole grain dish. Great source of protein and fiber! 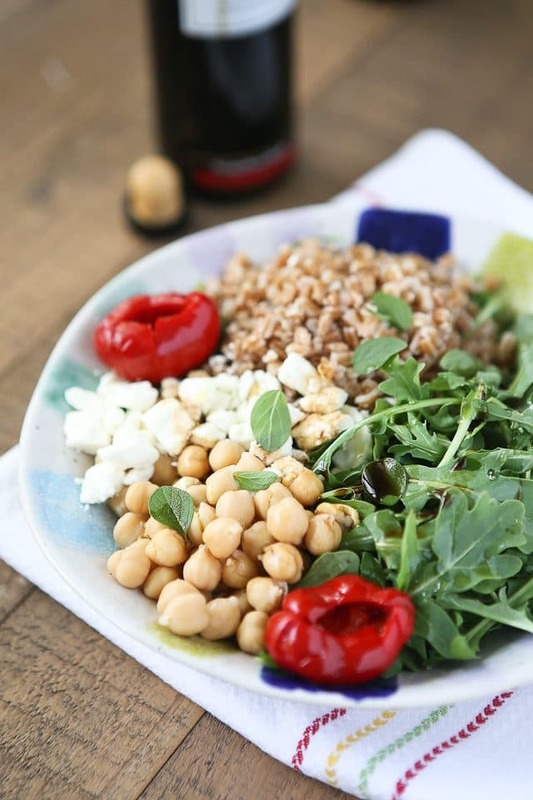 Click here to Pin this Mediterranean Farro Salad with Arugula and Chickpeas recipe! If I’m going to eat a salad a day successfully each week, I tend to pick my “salad of the week” and just go with it to keep things on the easy side. 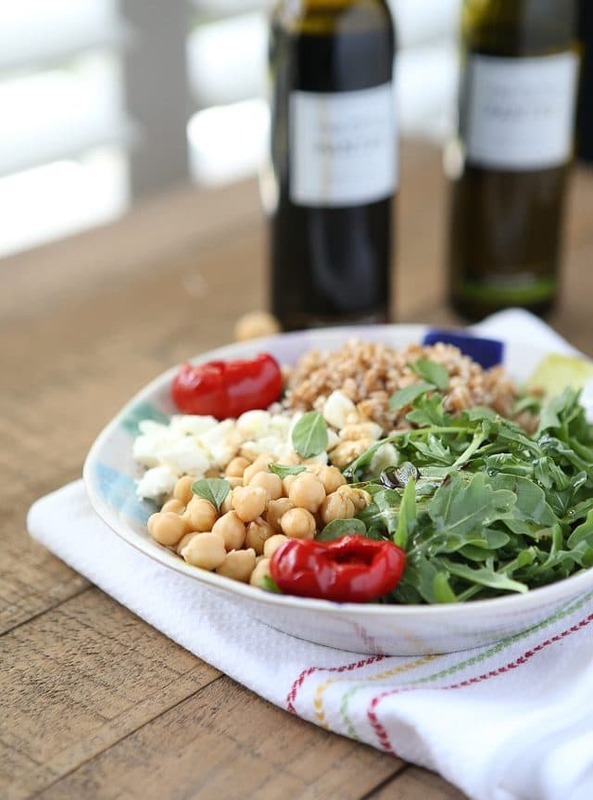 This particular Mediterranean Farro Salad with Arugula and Chickpeas was my salad of the week a couple of weeks ago and I’m ready for it to make a comeback this week. It’s so good. I am in love with farro and it’s versatility. You can add it to soups like this Slow Cooker Chicken and Farro Chili or make an incredible grain salad like this Harvest Farro Salad. Either way it’s always a great addition because it’s such a hearty grain, filled with protein and fiber. It makes you feel good when you eat it. My advice is to cook up a batch (it takes a bit of time, similar to brown rice) and store it in the fridge ready to go for salads like this one, or if you’re into meal prep, prep your salads (minus the oil and vinegar) in containers and they will be ready to go when you are (I love these containers for salads to help me with meal prep). 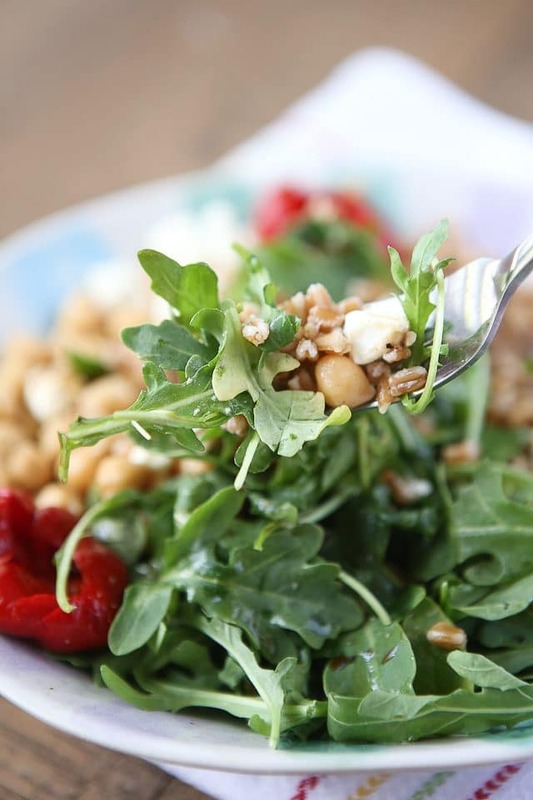 Arugula is in season right now, and if it’s warm enough where you are living right now, so are fresh herbs. 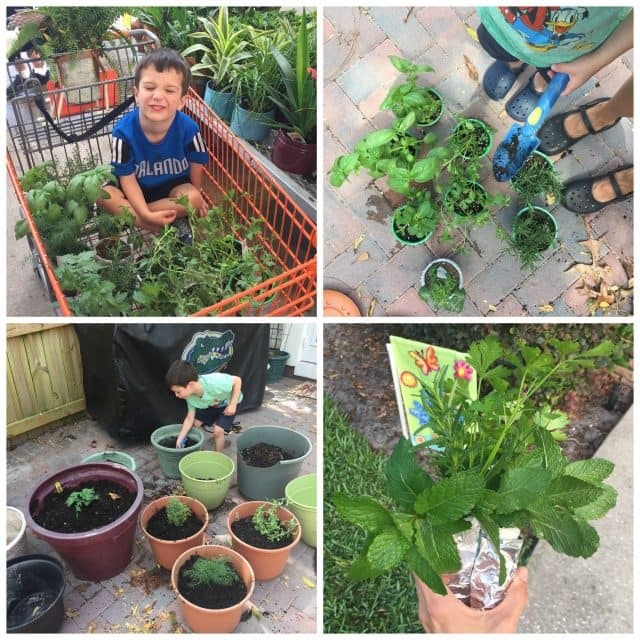 My littlest son and I recently got our our container herb garden back in business and I am loving being able to step outside and snip a few leaves to add to whatever I’m cooking. One herb I absolutely adore but I don’t think gets a lot of love is fresh oregano. Add it to anything Greek, or anything that includes roasted peppers and you will be blown away by the flavor. I added some fresh oregano leaves to the top of my Mediterranean Farro Salad and in seconds this salad was elevated with fresh flavor. Fresh herbs tend to do that. There is a lot more seasonal inspiration where this came from. 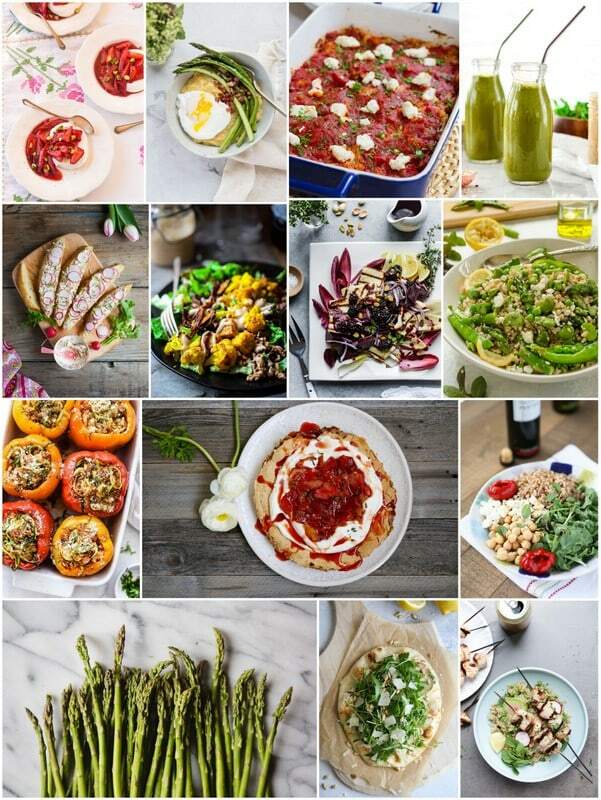 Look below the recipe to see what’s in season for May and what my #EatSeasonal friends cooked up for this month. Arrange ingredients into a large bowl or plate and drizzle with balsamic and olive oil. Sprinkle with a little salt and pepper to taste. I love farro because it has such a great “chew” to it. Makes for really hearty and satisfying salads. Loving all the ingredients here. Can’t wait to try it! totally agree about the chew!! It’s so hearty and I love it in soups too. Thanks Liz! I could eat mediterranean food all day every day! This salad being no exception! I am SOOOOOO jealous of everyones garden right now, but still have zero desire to get out there and get my hands dirty. Can’t my garden just magically appear in my backyard? ha ha! What a good idea–make a basic salad and add to it all week. Love this whole combo! This is a great salad. Have never had farro before. Has kind of a nutty taste. I understand it dates back to the Roman Empire.